Juanita Church, 91, of Tampa, FL, formerly of Kingsport, died Saturday, December 15, 2018, at her home after an extended illness. 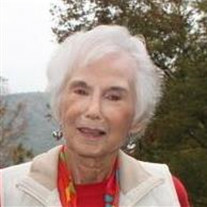 Born in Appalachia, VA, she graduated from Hancock County High School and attended ETSU. Juanita was a homemaker and a member of First Presbyterian Church. She enjoyed traveling, playing bridge, and spending time with her family and friends. She was a member of the Greenacres Garden Club, Birthday Club, and Presbyterian Women. She was preceded in death by her husband, Robert Carroll Church; and three brothers, Edward, T.M., and Elmo Anderson. Juanita is survived by her daughter, Robin Church Bell and husband Craig of Tampa, FL; two grandchildren, Meg Denison, and Adam Denison and wife Shali; and several sisters-in-law, nieces, and nephews. The funeral service will be conducted at 12 p.m. on Tuesday, December 18, 2018, at First Presbyterian Church with Rev. Sharon Amstutz officiating. In lieu of flowers, memorial contributions may be made to First Presbyterian Church, 100 W Church Cir, Kingsport, TN 37660.